It’s great to be able to record and produce music with the equipment and desk space you currently have available. However, there generally comes a time where you really want to hone your setup and make the best use of your space. Since there are many similar studio desks on the market, we’ve put together five options suitable for both professional studio and home use. The three-segment Studio RTA Producer’s Station Made of maple will provide you with enough space for your electronic equipment and various accessories. On the left and the right side of this desk, there are two empty racks of the same size. 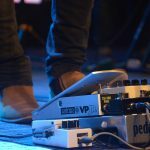 A music producer or a musician will also find two small 13-space racks for CDs on the larger board. They’re covered with a large board, on which there’s another smaller board, for a computer monitor. This upper board can accommodate a smaller keyboard, as well. Both boards have smaller, pull-out boards, for a computer keyboard or a synthesizer. Since cables often get tangled up, especially in improvised home studios, the RTA Producer’s Station comes with practical cable organizers at the back of the desk. When you sit at this station, the first thing you notice is that everything is at the reach of your hand. Also, it’s easy to place your CDs, records, music sheets, books, and other things that you might need during recording sessions. In case you need to move your studio to another place, you can simply slide the entire desk on casters. Many musicians and producers need adjustable studio desks, due to their limited recording spaces. 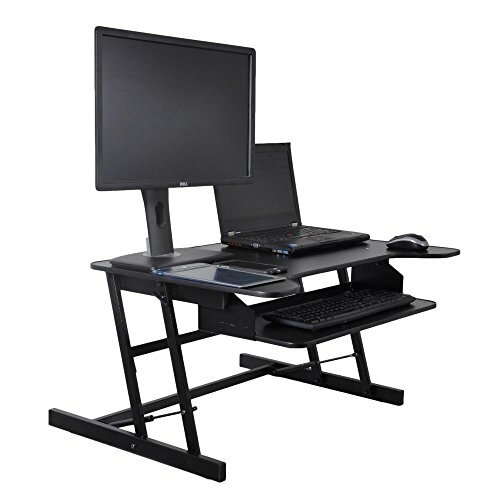 Such people will appreciate the features of The Pyle Height Sit & Stand Adjustable Desk. It comes with two boards, one smaller and one bigger. 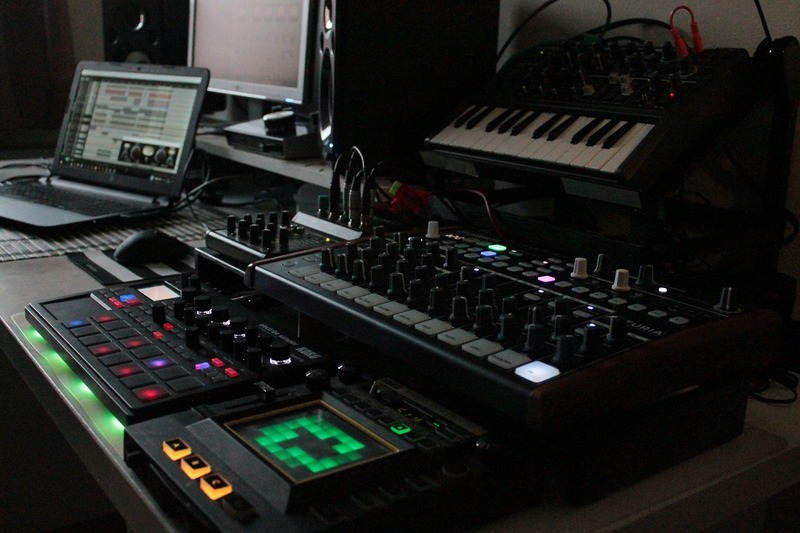 The larger one is a firm tray on which you can put a smaller studio mixer, a laptop, or a computer monitor. As for the lower, smaller, sliding tray, it provides enough space for a computer keyboard or some studio add-ons. 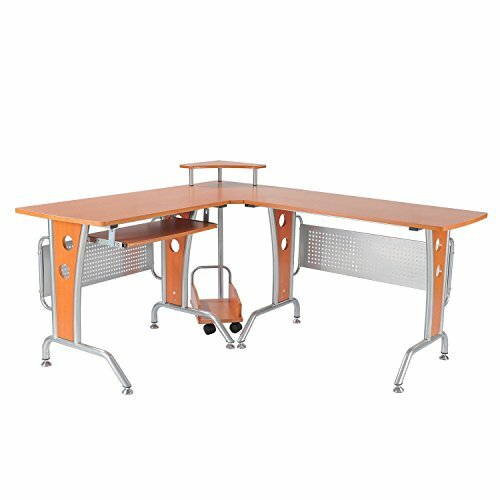 The desk construction is made of steel, which ensures stability for the equipment you place on the desk. In case you prefer standing to sitting while you’re recording or mixing your music, this Pyle desk will meet your ergonomic demands. Still, if you like the sitting position more, this desk ensures equally ergonomic positions for that posture, as well. You can also use the sit-desk converter and add some Pyle ergonomic features to your existing studio desk. Some musicians and music enthusiasts have extremely limited space in their studios. Because of that, they need a handy but compact studio desk. This is where the Arch Tower Studio Desk is a perfect fit. This tower station can be easily installed in different recording rooms. Apart from the main board and the small pull-out tray for the keyboard, there’s also the tower part. Here you can put various accessories that you might need for studio work, like music sheets. Further, there are small elevated stands for computer speakers on each side of the main board. The spaces under the speaker stands can be used as CD racks. As for additional space for records or CDs, you put some racks or cases on the lower board and keep these things there. The back of the tower is supported by metal panels, which makes the entire construction solid and durable. This corner-fitting, L-shaped studio desktop is a great choice for all sorts of recording and control rooms. The left side has a pull-out board, for your computer keyboard or a small studio mixer. In the corner of the desk, there’s a stand for a computer monitor. One of the greatest advantages of this desk and its shape is the right part, where you can easily place a large keyboard and mixer. Since there’s a lot of space under both desk boards, you can place additional CD racks, boxes, or even cases for musical instruments in these areas. 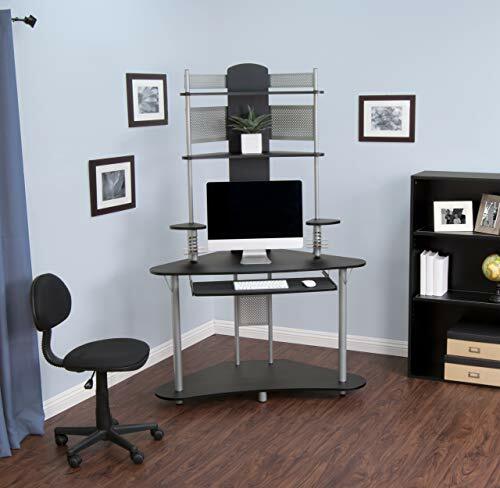 The desk is held by a steel frame, which ensures long durability and stability. The overall minimalist design that provides ample room for musicians is another perk that opting for the HOMCOM 61’’ Office Workstation. If you need a sturdy but modern-looking and durable studio desk, the Walker Edison 3-Piece Contemporary Desk is the right fit for your studio. Just like its name tells you, it comes in three pieces: the left part, the right part, and the middle/corner part that connects the other two pieces. 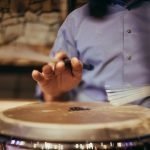 There are no extra shelves or drawers, which makes it a suitable choice for people who want to keep things simple when they’re making their music. The durability of this desk is derived from the materials it’s made of. In line with that, the boards are made from safety glass, while the legs are made from powder coated steel. Its design is one of the most impressive things about this desk. While it looks a bit brusque and sturdy, at the same time it’s an attractive piece of furniture. It will fit well in a modern, minimalist recording room. This Walker Edison desk comes with a special computer stand, in case you need a desktop computer for your studio work. Also, there’s a pull-out tray, where you can put a small laptop or a keyboard. A compact studio desk with three different tiers, the Omnirax Presto 4 Studio Desk is a fine option for both professional producers and home music enthusiasts. The central board is enriched with an additional sliding board. The former can be used for all sorts of keyboards or studio mixers. The latter has enough space for a computer keyboard or additional studio accessories, such as headphones, microphones, etc. The rack between the central board and the upper board can be used as the additional storage space. Also, there’s even more room under the table where you can put some other recording items or even smaller musical instruments. The Presto desk comes in different variations so you can choose from models made of maple or mahogany. They can either be covered with melamine gray slates or melamine laminates. Since it’s a thick, heavy studio station, it’s equipped with durable casters. It can be easily moved and placed to different recording environment. Finding the right studio desktop is an important thing because it can dictate the ergonomics and positioning of your gear. That’s why you need to take your time and weigh all the pros and cons of different options before you make your decision. 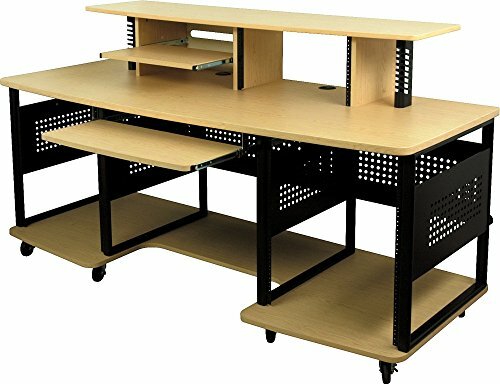 All the desks in this guide have some advantages and they all come with great design features. Your choice will depend on the space you can use for this item and on your budget. Whatever desk you pick for recording, mastering and mixing music, we hope that this guide will help you make up your mind.